Main varieties include Snow Crown, Polar Express, Andes, Freemont, Sierra Nevada, Majestic and White Rock. Cauliflower is an excellent source of Vitamin C, a good source of folacin and a source of potassium. Cauliflower probably originated in Asia Minor, but was available almost exclusively in Italy until the 16th century when it was introduced to France and eventually to other areas of Europe. It was first grown in North America in the late 1600s. 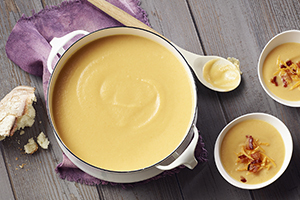 Today, thick cauliflower soups are popular in France and Eastern Europe. Sardinian cooks combine garlic, olive oil and capers with it to make zesty salads and hot dishes. In India, it's cooked with potato and onion to make a rich vegetable curry. Select heads that are firm and tightly-flowered, with fine white or creamy white florets and fresh-looking, green leaves. A large head will weigh about three pounds and will serve four. Brown spots on a white cauliflower are most likely only water marks, but yellowish ones may indicate excessive age. Store unwrapped in refrigerator cooler for up to five days. Wash, drain and remove outer leaves; cut and trim stems. Usually cauliflower is broken into small florets, but it can also be cooked whole. Steaming a whole cauliflower takes 20 to 30 minutes. To microwave cauliflower pieces, place in microwave-safe baking dish with 1/2 cup of water. Cover with plastic wrap, cook at high (rotating the dish at half-time) for 8 to 10 minutes or until stem ends are tender. Let stand, covered, 2 to 3 minutes before serving. To microwave cauliflower whole, clean, trim and wrap in plastic wrap. Place, sealed edges down, on microwave-safe serving dish. Cook at high for 3 minutes, turn over, and cook at high for 3 minutes more or until tender. Let stand, covered, 3 minutes before serving. Stir-frying cooks cauliflower quicker than steaming, so be sure to check for tenderness as you cook. 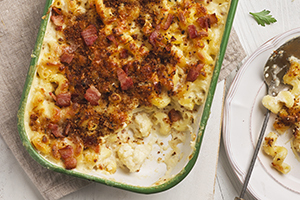 Cauliflower is superb lightly dusted with grated Parmesan or Cheddar cheese, or coated with a delicate cheese sauce. It marinates well for mixed vegetable salads and is good in curries.